And we got one hell of weather now in Egypt. We do not have stable weather in Cairo and Giza between hot weather and rain at the same time. 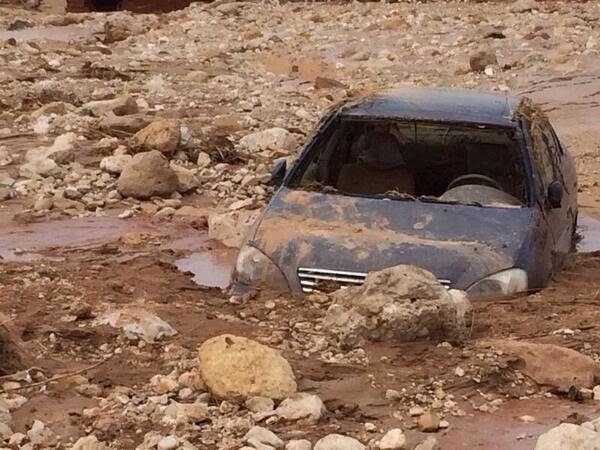 On the other hand things are terrible in the East , heavy rains hit Red sea and Sinai.Some roads are cut in Nuweiba and Taba in South Sinai. The biggest damage is in Red Sea and Suez highways where Ain El-Sokhna , Zafarna , Al Arish and Hurghada highways were all affected badly with the heavy rain. The roads are blocked because of the floods. People are stuck there whether residents or workers or just weekenders trying to spend a weekend but the weather has another say about this !! The army is sending an urgent rescue team to save the people who were stuck there. There are no water or electricity since last night according to the people there. The situation is so bad. I wondered why we do not have a rain drainage system in that road and all the answers came that it will be hard and impossible due to the nature of the road itself as it is in the stream of the heavy seasonal rains. It snowed in Al Arish !!!! The photo gallery is after the break.